Get windows logs from this folder, get “time created” plus “message body”, and export to .csv file to view in Excel. 1. Loaded Windows 2008 R2 and associated patches. 2. Upgraded to Windows Server 2012 from 2008 R2. 3. Clean install of Windows Server 2012, no windows updates. 4. Freshly reimaged system running Windows 7 from Service Desk. 5. Upgraded to Powershell 4.0 beta. 6. Switched to PowerShell –Version 2 switch. 7. Applied US English language 3rd party PowerShell custom script with my query nested. All actions had resulted in the same blank column for ‘Message’ property. Saving out logs manually had given me the following prompt and hope. However, the originating server had provided the same empty results. 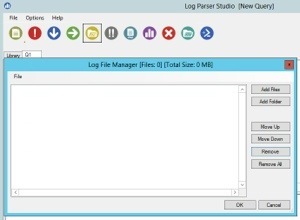 Reading a few more blogs, I had read up again on Log Parser Studio 2.0. This application had provided something new, a mix of SQL and Powershell commands. 8. After launching LPS 2.0, I had selected the folder for my logs (i.e. 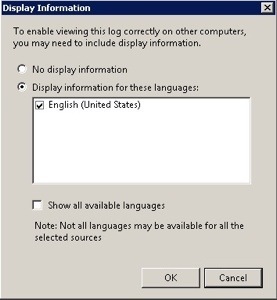 C:\logs) with this icon from the following window. 9. Updated the SELECT statement to use STRING for message property with TOP 10 statement provided by LPS 2.0. The following was successfully returned for ‘Message’ property. 10. After dropping the TOP 10 reference, I had pressed the following button to export the T-SQL commands to get a PowerShell script. 11. After LPS 2.0 exporting myscripts.ps1, I had executed Set-ExecutionPolicy RemoteSigned at prompt. Finally, I had been able to convert .evtx files into .csv files with the ‘Message’ column full. Below was example of the original script. 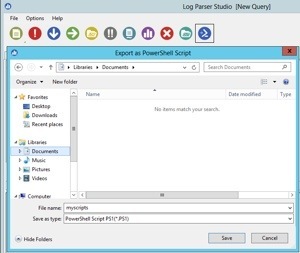 In the end, Log Parser Studio 2.0 was a great find for those looking for another means of generating PowerShell scripts. As for the original query not working, some other bloggers have pushed the notion of a software bug. 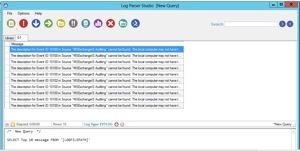 This entry was posted in IT Administration, Microsoft Exchange, Powershell and tagged Get-Winevent returns a blank column for 'Message' property, Log Parser Studio 2.0, Microsoft Exchange, powershell, select-object -property message, Windows 2008, Windows 8. Bookmark the permalink.